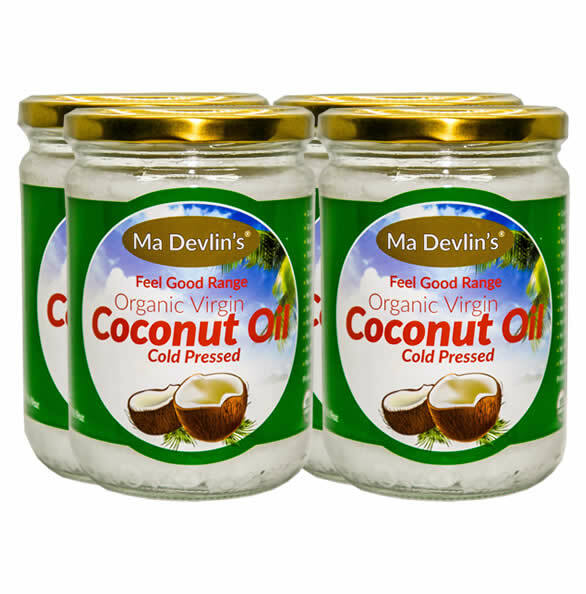 Ma Devlin’s Premium Extra Virgin Coconut Oil is different with an absolutely delicious taste and cold pressed from fresh coconuts without any heat during the production cycle ensures the premium quality and freshness of our coconut oil. With no Cholesterol or Trans fats. There is a number of uses to many to mention, but here is a few, On the skin as a basic lotion, As an eye-makeup remover, Topically to kill yeast or yeast infections, On feet to fight athlete’s foot. The antiviral, antimicrobial and anti fungal properties of coconut oil may be beneficial to the immune system, helping to ward of viruses and bacteria. Naturally tasting can be used as a butter for spreading on sandwiches or toast, delicious in beverages, smoothies, used for every day cooking and baking. Also has great properties for skin and conditioning your hair. Its truly a versatile product. Ma Devlin’s Premium Organic Extra Virgin Coconut Oil is different with an absolutely delicious taste and cold pressed from fresh organic coconuts without any heat during the production cycle ensures the premium quality and freshness of our coconut oil its natural and unrefined. No cholesterol or trans fats its pure cold pressed oil great and is available 500 ml jars. Taken as Dietary Supplementation – Take 1-2 tablespoons per day for best results. Excellent for cooking up to 350°F/176°C. Can be used as a dairy-free alternative to butter in baking and all of your favorite foods. Can be used as a luxurious body moisturiser. Rich in Medium-Chain Triglycerides (MCTs) MCTs are a unique form of fatty acids that are used by the body as a source of energy and have been shown to be beneficial in helping to maintain a healthy weight, increase stamina and promote thyroid health for an efficient metabolism. Store at room temperature. if stored below 23 oC the oil will solidify, at temperatures above it will melt, this is a normal process and none of the goodness is lost during this process.